The electric popcorn popper hit the market in the 1970s. Since that time they have become much "smarter", more reliable, and less expensive. The electric popcorn popper uses oil to pop the corn identical to the stovetop methods. Therefore the resulting popcorn is very similar to that made on the stovetop. However, most folks agree that the electric popcorn popper is easier to use and safer as well. Also, similar to the specialty stovetop poppers, the electric popcorn poppers have a stirring rod in the base to keep the kernels and oil spread out evenly. The nice thing about the electric poppers is that they turn the stirring rod for you, unlike the stovetop makers. You would expect it to be difficult to recommend just one electric popcorn popper since they all have nearly the same set of features. However, there is one unit that is clearly the best selling electric popper - and I believe that's because it simply works better than the rest. Consequently, I would suggest you go with the West Bend 82306 Stir Crazy Electric Popcorn Popper . You will find a detailed description of this electric popcorn popper on the Stir Crazy Popcorn Popper page. If I had to pick a second choice I'd recommend the Nostalgia Electrics TPM-100 Stirring Theater Popcorn Maker . This electric popcorn popper worked satisfactorily for most users. But it is more expensive than the Stir Crazy. I was surprised and disappointed with the performance of the Cuisinart CPM-900 EasyPop Popcorn Maker . I have purchased numerous small appliances from Cuisinart and have always been pleased with their quality and performance. This popper had the typical Cuisinart premium pricing but apparently fell quite short of the expected quality. When it works it makes great popcorn but the reported failure rate is astounding. Discouraged owners report life spans from 2 days to 3 months as being common. Not sure what happened to this unit but it is clearly tarnishing a brand that was well known for quality. The most significant disadvantage of an electric popcorn popper is the time it takes to pop a batch of popcorn. Most take at least five minutes compared to about three minutes using most other popping methods. Two minutes doesn't sound like much but in certain instances it can seem like an eternity. Another limitation of an electric popcorn popper is that there is no control over the amount of heat applied to the oil and kernels. This is critical since the temperature of the oil has a huge impact on the quality of the popcorn. If the temperature of the oil is too low or too high the kernel will not pop to its maximum size - if at all. With the stovetop popcorn popper you have complete control of the amount of heat applied and can, through experimentation, tailor it to produce high quality popcorn with your popper and stovetop. Every electric popcorn popper has some type of stirring rod that turns constantly to keep the kernels and oil spread out evenly. This action decreases the number of unpopped kernels known as "old maids". It also keeps the popped flakes from sticking to the bottom of the pan and burning. Typically the plate that heats up the oil is coated with a non-stick coating. This makes it easier the keep the popper clean. The beauty of the clear cover is that you can watch the kernels popping. 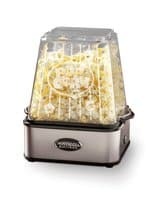 This makes the electric popcorn popper a favorite of kids who can become mesmerized watching this unique display. In the top of the cover of an electric popcorn popper is usually an area where butter can be placed to flavor the popcorn as it pops. This area contains slots or holes and has a dual function. The first is to allow the steam from the exploding corn to exit the cover keeping the popped corn fluffy and dry. The second function is to allow butter, melted by the hot escaping steam, to drip down onto the popped corn. This sounds really great but, unfortunately, does not always work as advertised. Two actions can be taken, however, that will greatly improve your probability of success. The first is to use butter that is at room temperature and soft. The second is to cut the butter into thin slices and spread them out in the butter melter area. Then you stand a great chance of having all the butter melted and dripped on the popcorn. There is a popcorn bowl integrated into every electric popcorn popper. The cover of the popper converts to the bowl. Once the popcorn is done popping you simply flip the unit upside down and remove the base. You're left with a large bowl of delicious popcorn. Important Note: As mentioned in the prior feature, the cover has slots or holes for the steam to escape during popping. These same holes are used for dispensing butter. So it's critical the remember, before you turn the cover upside down to replace the plastic cap on the top of the cover. Failing to do this can lead to a buttery mess. Each electric popcorn popper will make at least 6 quarts of popcorn. This is a good amount and more than many other types of poppers. An electric popcorn popper is significantly safer than making popcorn on the stovetop. That said, there are still opportunities for accidents to happen. So please never leave the popper unattended when popping, especially if there are children present.